A commemorative open armchair; the curved panelled back with carved shield and flag cresting, the splat carved with a low relief panel depicting a lion in the village of Waterloo, trampling the vanquished French standard, above a plumed helmet flanked by banners, the reeded arms with lion terminals emerging from acanthus, the curved supports with lion paws, above a shaped padded cushion covered in crimson velvet with metal thread galloon, the frieze carved with ribbon-tied oak leaves, on reeded tapering legs, the lower part wrapped in acanthus, on brass caps and castors. This remarkable chair is made from the elm tree which stood on the battlefield of Waterloo. It was situated on the ridge chosen by the Duke of Wellington, Commander-in-Chief of the Allied Forces to make the final advance on Napoleon, ensuring total victory. Soon after the battlefield became a focus for tourists and souvenir-hunters plundered the elm tree. By September 1818 the farmer who owned the cornfield in which the tree stood had determined to fell the tree to prevent further damage to his corn from the endless train of visitors. By chance, an antiquarian, John Children, a Librarian in the British Museum was visiting the battlefield with his daughter and cousin. A sketch of the elm tree made by his daughter survives. Hearing that the tree was to be felled the very next day, Children bargained with the farmer to purchase the wood and sent it to London. 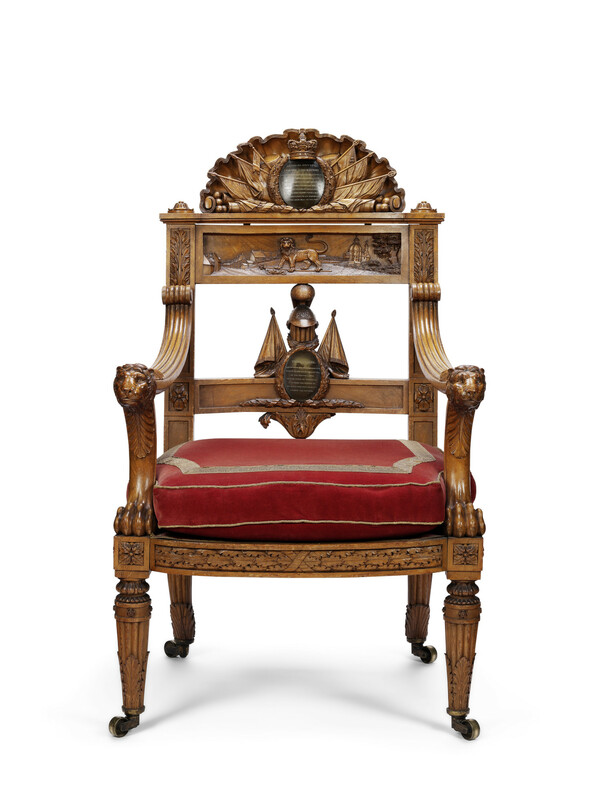 In spite of his own modest circumstances, he commissioned Thomas Chippendale the Younger, one of London's leading cabinet-makers to create 'a chair worthy of the occasion made for the Prince Regent'. 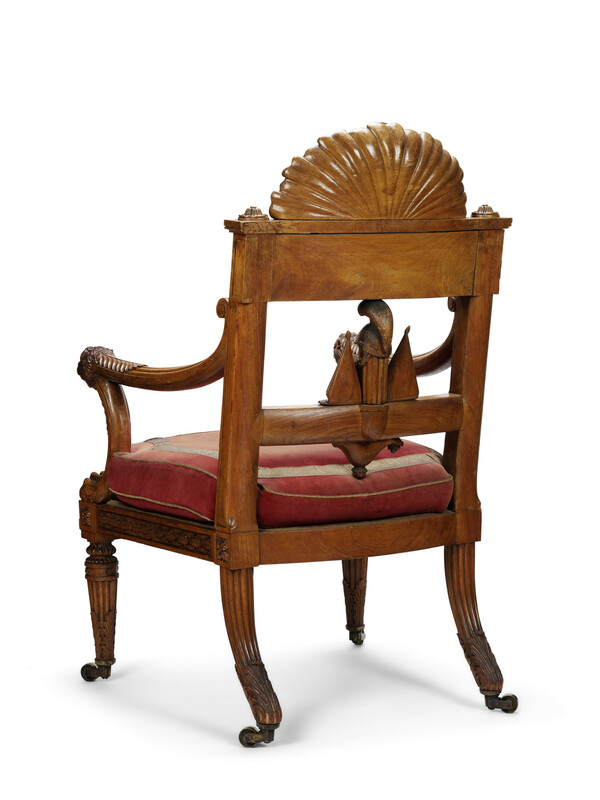 The armchair was delivered some years later, to Carlton House on 24 February 1821. 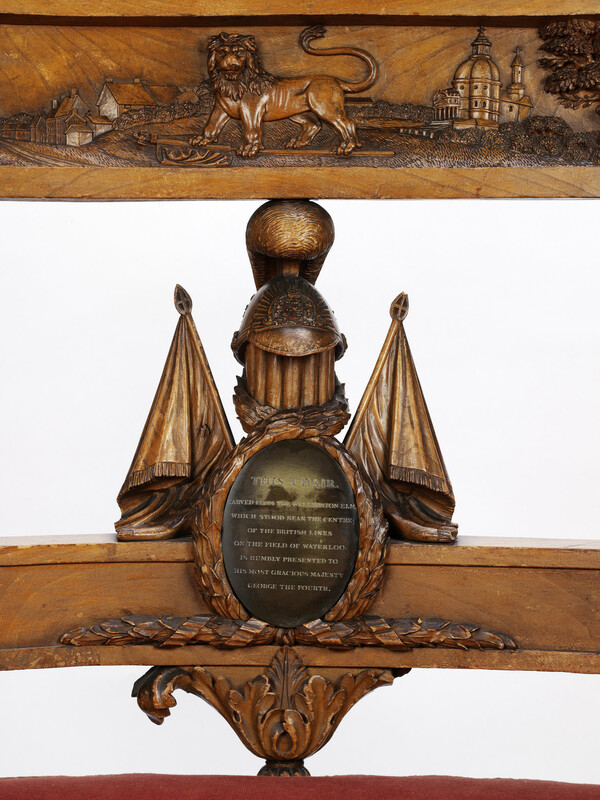 The chair's design is unashamedly patriotic, and unreservedly victorious: the toprail panel is carved with a view of the village of Waterloo, after T. Sutherland's engraving published in 1816 depicting the village of Waterloo the day after the battle. 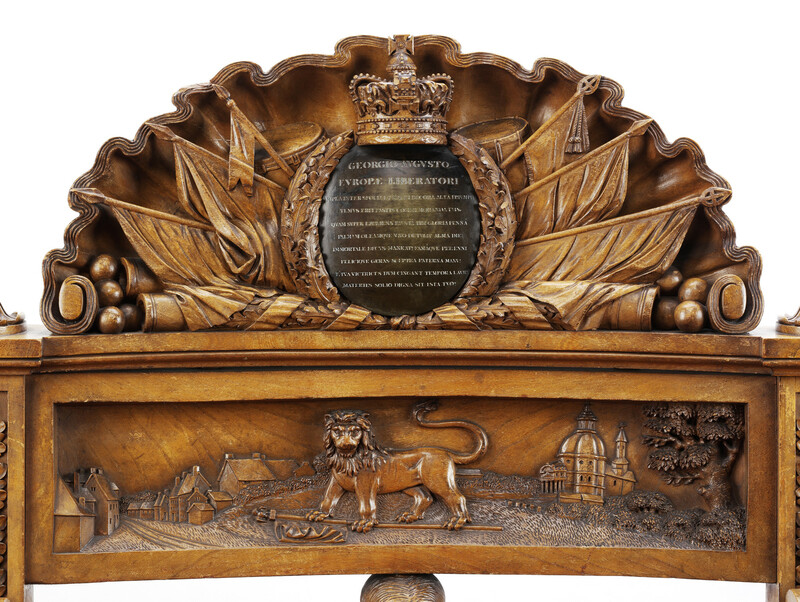 The back's cresting is derived from a military trophy within half a shell and in the centre an oval plaque with a dedicatory inscription, 'THE CHAIR / CARVED FROM THE WELLINGTON ELM / WHICH STOOD NEAR THE CENTRE / OF THE BRITISH LINES / ON THE FIELD OF WATERLOO / IS HUMBLY PRESENTED TO / HIS MOST GRACIOUS MAJESTY / GEORGE THE FOURTH'. Another inscription, in Latin (supplied by the Duke's elder brother, The Marquess of Wellesley), 'GEORGIO AUGUSTO / EUROPAE LIBERATORI / AMPLA INTER SPOLIA ET MAGNI DECORA ALTA TRIUMPHI / ULMUS ERIT FASTIS COMMEMORANDA TUIS, / QUAM SUPER EXORIENS FAUSTA TIBI GLORIA PENNA / PALMAM OLEAMQUE UNO DETULIT ALMA DIE: / IMMORTALE DECUS MANEAT! / FAMAQUE PERENNI / FELCIQUE GERAS SCEPTRA PATERNA MANU! / ET TUA VICTRICES DUM CINGUNT TEMPORA LAURI / MATERIES SOLIO DIGNA SIT ISTA TUO' appears in the lower part of the back, accompanied by military colours, a victor's laurel wreath and a plumed helmet. 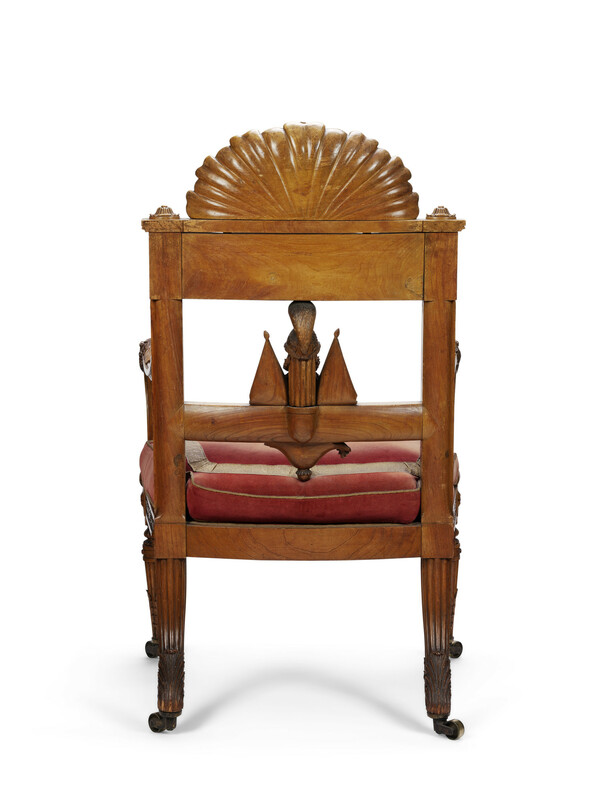 The elm tree was still good for further cabinet-making, and another chair was made, for Children's personal use, but later presented to the Duke of Wellington in 1837, on the anniversary of the battle. It remains at Apsley House. Other mementoes were fashioned from the timber: a minerals cabinet, work-table, a small stand (made by Mr Children himself) with the bark on, made to support a bust of the Duke of Wellington. Children disposed of a section of the tree to the Duke of Rutland, a college friend of his, who also turned it into a chair. 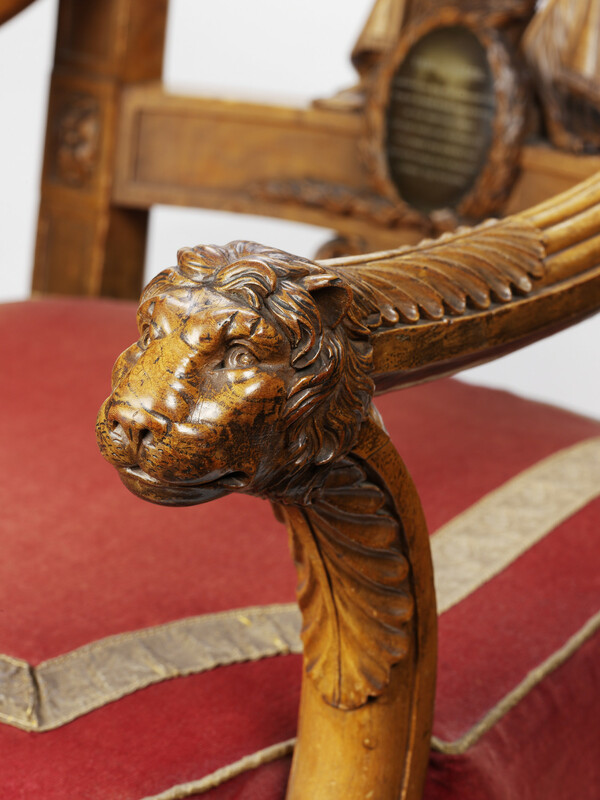 Beside the three chairs mentioned above, a small table cabinet (surmounted by a carved seated lion above the inscription 'WATERLOO') was sold at Christie's, London, 6 July 2000, lot 10; a writing-table was sold by Harris Lindsay Ltd, at Christie's, London, 10 May 2006, lot 140. 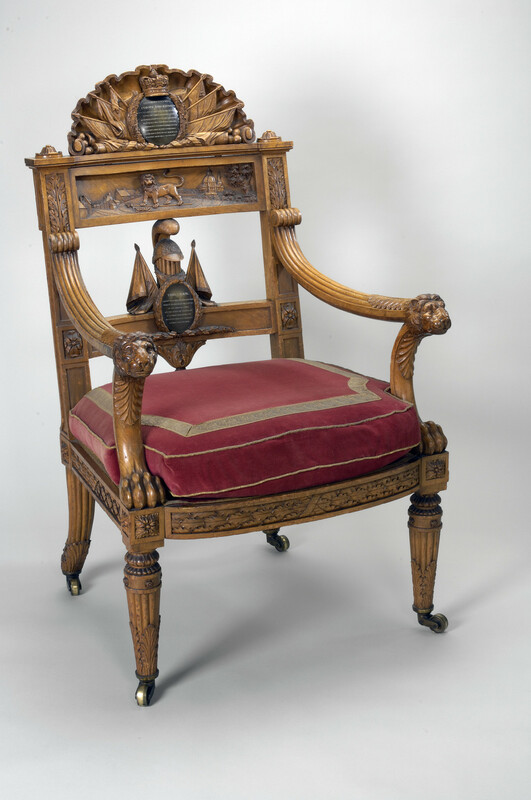 The timber acquired from the battlefield of Waterloo in 1818 by John George Children FSA (1777-1852); chair presented to George IV at Carlton House, 24 February 1821.